William (Bill) Higgins lived on Dale Lane Blidworth with his wife Mary Jane until his death in 1965. 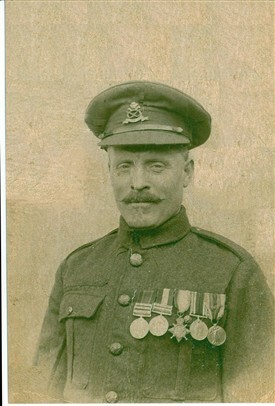 He served in the North Staffordshire Regiment on the Western Front throughout the whole of the Great War and was decorated for bravery in 1916, when he and 5 other members of "A" Company No.3 Platoon, voluntarily and under heavy shell and machine gun fire recovered the dead body of their young officer, 2nd Lt. Gerald Harmer. Their Commanding officer Lt. Colonel Bradley C.M.G. informed the family of 2nd Lt. Harmer. The parents replied with a very moving letter to the Commanding Officer expessing their gratitude and thanking the men for their gallant action. William Higgins was a regular soldier from the age of 17, and also served in South Africa during the Boer War. He was awarded the Queens South Africa medal with clasps and Kings South Africa Medal with clasps. His stepson William Durber enlisted into the North Staffordshire Regiment at the outbreak of WW1 but unfortunately lost his life in 1915 in Belgium and is buried there in an official war grave. Following his many years of service with the military and with the demise of the coal industry at that time in Staffordshire, William brought his wife and family and his mother to the village of Blidworth . He worked underground at Blidworth Colliery until his retirement at 65. William and Mary Jane Higgins raised 6 children altogether during their years living on Dale Lane Blidworth and there are still numerous descendants in the village and surrounding area today who are extremely proud of their family. This page was added by Alan Higgins on 03/04/2014.